Hail and high winds can damage your home. It is easy to see your windows and siding from the ground but the roof is not. And if you aren't sure what to look for you can end up with problems. 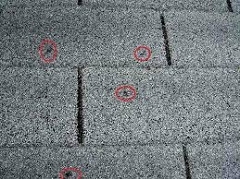 That is why you need a HAAG Certified Roof Inspector to take a look. Our HAAG Certified Inspector is Tim Krueger. Tim is our Sales Manager and has over 20 years in the business. He has experience and the education to give you an accurate picture of the condition of your roof. If you have roof damage concerns please give us a call.